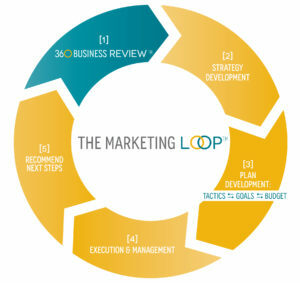 Link over to our website… and you’ll find an overview of The Marketing Loop ™. It’s the process we follow when helping our clients create a marketing & sales plan. In this post – and the next several – I’ll walk you through the steps of that process to help you get started on the 2013 marketing & sales plan for your firm. Conduct a critical review of all of your existing marketing & sales efforts; this includes marketing materials, email programs, website, blog, social media sites, advertising, sales proposals, presentations, bids, conference exhibiting and more. Bring in some objective outsiders (even clients) to help. Do a critical review of your existing marketing & sales processes and structure; this includes marketing & sales plans, strategic account programs, goal setting, staff structure, staff development, commission plans, lead generation and lead nurturing programs, measurement & KPIs and more. Do a review and analysis of revenue history, including long-term trends, revenue by vertical industry and revenue by service line/product; one of my favorites: look at ‘revenue by client by year’ for the past 5 or so years – you’ll see whose business is growing with you, whose is declining and whose has stopped. Remember the ‘Perato principle’… also known as the 80/20 rule? Conduct a 80/20 review of your client base. Look at the top 20% of your clients (based on revenue) and do a review of them, looking for commonalities and consistencies across the group; this could include industry, type of firm, size, geography, buyer persona, services purchased, applications, etc. What you’re looking to do is create an “ideal buyer” profile. When you have that, you can create a marketing & sales plan to go find more just like it. Conduct a review of & comparison of your key competitors’ marketing & sales efforts – look at their websites, blogs, social media sites, online and print ads, downloadable materials from their websites; what’s their messaging, their position, their points of differentiation? Also, read their news and product pages… anything new going on? Conduct a survey of your existing clients, centering on their perception of your firm, your points of differentiation and the quality of your work; one of my favorites: also conduct a survey (1-on-1, in-person – if possible) of your ex-clients with a focus on what you did right/what you did wrong, why they used to do business with your firm but no longer do and why they chose their current supplier. Conduct a SWOT Analysis, but don’t just leave it in the hands of your executives; get a cross-section from your firm to do it – different levels and different roles – and keep it anonymous. Be warned: There’s a lot of data to go through in this phase and it’s easy to get bogged-down in the minutia… but this level of understanding is critical for moving forward in the process. That’s PHASE 1 for building your marketing & sales plan for 2013. It’s the foundation you need for making informed decisions for the next step in the process. If you’ve done this, your 2013 plan is sure to provide a competitive advantage that others – who don’t take the time to conduct this review – simply can’t match.